I taught mixed media collage for three years in Lincoln, California, and one of the things I always said to my class was that the first people to ever use the technique of adding texture and three-dimensionality to art were cavemen and cavewomen. (I am assuming women also contributed to the ancient art on the rock walls inside caves.) Recently new evidence of those artistic mixed media roots has been found in caves. In the introduction to my mixed media collage class I said this, “Abandon your pre-conceived notions about traditional fine art and begin a mixed media journey where improvisation, freedom from boundaries, self-discovery and originality are valued higher than any predictable destination.” Mixed media painting is a highly improvisational and innovative type of art – a “fly by the seat of your pants” (or paints) type of art. It is pretty much balls to the wall – gaining new ideas as you go and incorporating them into your fast moving composition. It is using what you have at hand and making the most of the world’s simplest gifts. Texture, pattern and color are the dance. Any degree of sculptural relief – where the painting’s texture comes up off the background in a tactile kind of effect – is much to be desired. Collage papers are welcome; as is any other kind of found object that might add fascination and special interest to the image. There is no order of things – you can start with paint or papers or your collection of found objects. This is Art with Abandon! It is the ultimate art in recycling, using old bits and pieces of things to create fresh, new fine art suitable for framing. This is not a new idea; people have been doing it for years – for eons of time. The very first cave artists who would now be classified as a mixed media artists were the inspired ones who first drew an image of an animal of some species and then – OMG – then glued some dried grass and other found bits of twigs and earth under the image with wet mud, creating a realistic, three-dimensional mixed media collage scene. Recently they have found just such images – more than one – to prove the extraordinary artistic vision of these very primitive people. Artists also utilized the rough surface and particular colorations of the rock wall itself by choosing to draw on specific locations that brilliantly enhanced their images in both 3-D contour and color. These people were very sophisticated in their artistic talent…very discriminating and wise in their choices. Can you imagine the cave mom, as she roasts a hunk of antelope over the fire while being pestered by her hungry family, saying, “Get some charcoal and go draw me a picture on the wall – dinner will be ready soon – now go!” And one person, perhaps just one at first, grabs some grass and a handful of earth and pebbles, then using wet mud left by the rain he/she pastes it under the animals, and in doing so positions his animals in a realistic landscape. Suddenly we have an entirely new artistic concept. Can you imagine how thrilled he/she must have been with that gesture? It gives me chills to think about it. Many locations around the world have also revealed handprints – hundreds of them. Plentiful and childlike, colorful and animated and most definitely a playful way of passing leisure time and leaving your signature. Children all over the world both in and out of art class do the same today with finger paints, clay, concrete or even mud. It seems that the more things change the more they stay the same. Art has always been universally appealing and it speaks the language of the ages. Put yourself inside a cave on a rainy day and what are you going to do? Well, paint of course! Or in the evening, by the glow of the fire, waiting for bedtime….you paint about what you saw during the day. 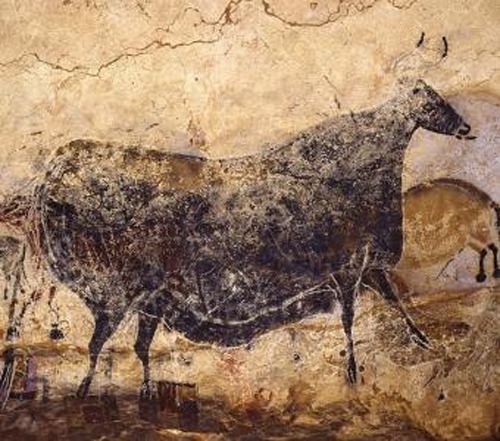 The level of detail, the intensity of the hunting scenes – it is just fascinating to observe in the primitive cave art from all over the globe. And if you choose to zero in on the cave art that depicts extra-terrestrial art showing weird Martian-type creatures and what look like space ships, then you will be off and running in an entirely different direction! It does make one wonder, does it not?